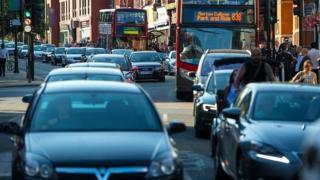 Diesel-car owners have been reacting to news that they will have to pay an extra £12.50 to drive into central London. From 8 April 2019 the most polluting vehicles will be charged extra for entering London's ultra low emissions zone (ULEZ). The charge will apply to petrol vehicles that do not meet Euro 4 standards and diesel vehicles that do not meet Euro 6 standards. The Sunday Times recently reported that a similar scheme for other UK cities will be unveiled soon. Mike Barker from Wokingham, Berkshire, uses his car to visit his daughter in central London. "The government encouraged us to buy diesel cars and now they are being discouraged. "I understand the need for clean, lower-polluting vehicles but my car is dealer-maintained and has low mileage and low emissions, but just because it is over four years old I will have to pay to enter London. "I feel as though I am being penalised twice because the resale value of my car will also be affected by this. "I'd be more than happy to pay based on emissions value, which is measured at the MOT stage. But I am being hit for a car that I pay a lot of money to maintain. It's punitive and unfair." Robin Seccombe lives in Bournemouth and has been looking to buy a new diesel car. "I'm totally confused about what's happening now. I have an older diesel car and I'm currently looking for a new car. "Do I get a diesel again? If I do, will I be penalised later on? "The sales people I speak to still have an agenda to sell diesel cars. "They are the most economical, provide the best performance and they still say they are the cleanest referring to the original government guidelines which is now out of date. "Car-reviewing media still prefers diesel models and makes no significant nod in the direction of future solutions. "Just how clean is a new diesel car in reality? Can we believe anything anyone says? "If I am about to spend thousands I want to know the truth about what I'm buying and the effect the car will have on the environment." Chris lives in Wandsworth, London, and says the car industry is as much to blame as the government. "I bought a new VW diesel car as we were told it's better for the environment but it looks like the car industry and the government wanted to boost car sales. I am now told I made a bad choice. "I do feel a bit duped. I find it hard to believe that major car manufacturers were unaware diesel cars had an emissions problem. "The government encouraged us to buy diesel cars but the car industry needs to take some responsibility as well." Derek Allen lives in Mayfair, one of the London areas in which the new charge will apply. He welcomes the new measures but says they should go further. "Our air is often foul from traffic, but there are other local concerns that are not being addressed. "One is black cabs, they are very numerous and it is not unusual to see black smoke coming out of the exhaust. "Another is the many cars with huge engines, not to mention heavy goods vehicles and buses. "The Park Lane area is not included in the new measures - I think it should be as there is an eight-lane highway there carrying toxic fumes into our lungs."